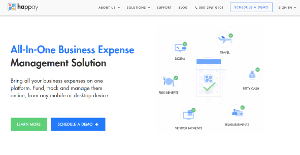 Happay is a comprehensive business expense management solution that enables businesses and organizations of varying sizes to fund, monitor, and manage their expenses online anytime and anywhere from their desktop computers to their mobile devices. This expense management solution is built in a way that concentrates on people, empowering them to spend efficiently and manage their expenses effectively without being too concerned with paperwork and reports. With Happay, employees are able to record their expenses as well as control them via smart prepaid credit cards. All details of their spend are recorded and stored in real-time, which helps speed up the generation of accurate reports for better accountability and reconciliation as well as smooth auditing. Happay allows businesses and organizations to set limits to their employee spending by specifying the purpose, allowable amounts, item categories, and more. With Happay, companies can issue employees with prepaid credit cards that are dedicated for specific purposes and purchases, allowing them to spend without losing control and going beyond budget. The system automatically records all expenses and their details. From airfare, meals at fancy restaurants, hotel accommodations, and materials and supplies for the office, Happay keeps tabs on all of the purchases and puts them all in a centralized location. With all expense information centralized and updated in real-time, users can easily access their data and know that they are working or seeing the most recent expense details. This simplifies the search for specific details, like the name of the establishment where the transaction was made, date and time of purchase, distance traveled from origin to destination, etc. Supporting documents such as bills, plane tickets, and receipts can be attached per purchase for unmatched accountability. This feature encourages transparency and greatly improves auditing processes, resulting in faster and more accurate reconciliations. It also gives the management a clear picture of their employees’ spending, allowing them to analyze their purchases so they can create and implement practices that will further improve and maximize their spending in the future. What Problems Will Happay Solve? 1. Laggard Reimbursement Processes – Manual reimbursements processes take so much time and can hinder a lot of processes, causing enterprises to waste enormous amounts of time and money on paperwork and manual data entry. With Happay, reimbursements are automated and absolutely paperless. Employees can upload bills and create requisitions, seek approvals and get reimbursed on the go. 2. Policy Violations – Companies have to deal with major cash leakages due to Policy violations have resulted in many companies losing money due to cash leakages, which represents about 20% of their entire spend. Happay’s custom spend policies and prepaid credit cards make it easy for the management to control their spending and prevent cash leakages. Employees are more aware of their policies and are alerted immediately if they are in violation. 3. No Control, no visibility – CXO level or the management has no real-time visibility or control over the spend trends. Happay’s Analytical Excel provides with custom data reports on spend trends on a monthly basis so the management can take more business-impacting decisions with more efficiency and confidence. It's essential to note that almost no service in the Accounting Software category is going to be a perfect solution that can fulfill all the goals of different business types, sizes and industries. It may be a good idea to read a few Happay reviews first as certain services may excel just in a really narrow set of applications or be created with a really specific type of industry in mind. Others can operate with an intention of being simple and intuitive and therefore lack advanced elements needed by more experienced users. You can also come across services that support a broad group of customers and provide a complex feature set, but that in most cases comes at a higher price of such a service. Ensure you're aware of your needs so that you select a software that has specifically the elements you search for. How Much Does Happay Cost? We realize that when you make a decision to buy Expenses Management Software it’s important not only to see how experts evaluate it in their reviews, but also to find out if the real people and companies that buy it are actually satisfied with the product. That’s why we’ve created our behavior-based Customer Satisfaction Algorithm™ that gathers customer reviews, comments and Happay reviews across a wide range of social media sites. The data is then presented in an easy to digest form showing how many people had positive and negative experience with Happay. With that information at hand you should be equipped to make an informed buying decision that you won’t regret. What are Happay pricing details? What integrations are available for Happay?